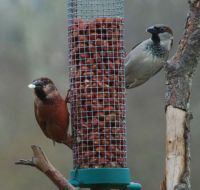 The BTO Abnormal Plumage Survey is a project to find out about birds with unusual plumage characteristics in gardens. The survey was launched by the Garden Ecology Team in December 2011 and is centred on pigmentation irregularities. Anecdotal reports show that birds can turn up in gardens with a variety of unusually-coloured feathers, but questions about which species are affected most frequently, in what ways and where these birds are found remain unsolved. The Abnormal Plumage Survey is gathering data to explore these questions. If you have ever seen a bird with unusual plumage in your garden, we would really like to hear from you. Please note that plumage abnormalities associated with feather loss are not being recorded through the survey.